‘Why must all these b***** people leave it until the last minute?’ said an exquisitely- and artistically-dressed woman of considerable antiquity in tones as close to High Bloomsbury as 2014 could produce. Well, it seemed a case of pot/kettle, as she was also visiting Virginia Woolf: Art, Life and Vision on its penultimate day. But perhaps she’d been several times before. You can’t tell with those types. The exhibition space was not spacious and it was also crowded. However, in about 90 minutes, I absorbed as much Woolf as possible. This was a heavily text-based (or as my friend LG said ‘biography with some pictures’) exhibition, although the pictures –photographs by Julia Cameron and Gisèle Freund, paintings by Vanessa Bell, and Duncan Grant — were glorious. When the exhibition opened several of my acquaintances debated the decision to include Woolf’s walking stick (which Leonard Woolf found by the river after his wife’s suicide) and the final letters in which she wrote of the terror of becoming ‘mad’ again. Was the inclusion of these objects gratuitous, and would it encourage ‘grief tourism’? Having seen the exhibition, I believe that was nothing ghoulish or macabre about the stick or the letters: these objects served to emphasise that Woolf’s death was a sad end to a life in which sadness was never far away. The narrative of the exhibition began with a photograph of the Woolfs; Tavistock Square house which was destroyed by bombing: one of the rooms decorated by Vanessa Bell was left exposed by the collapsed walls. This photograph, taken in 1939, ingeniously plunged the visitor in media res, or rather to the end of things: as we worked around the exhibition, it did seem that by beginning with this photograph, the trajectory of the narrative made destruction of the house serve as a catalyst for the final recurrence of Woolf’s painful mental instability and her suicide. Rewinding to the start of her life, the premature death of Julia Stephen, followed by Stella Duckworth, and Thoby Stephen must have caused unimaginable pain. In biographies, this series of tragedies never made quite the same impact on me as the series of photographs and letters we saw here. Few people could survive such events unscathed. 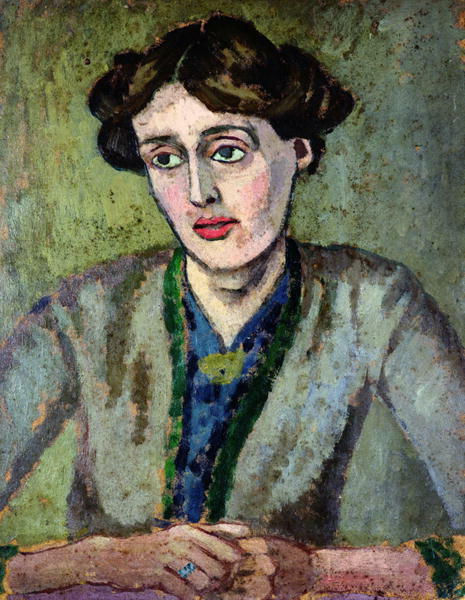 The arrangement of objects and pictures throughout the exhibition were constant reminders of the effects of these deaths, and Woolf’s life-long vulnerability, despite the determined devotion of Leonard and the network of the Bloomsbury Group. Then there were the books, and the Hogarth Press. To an extent, I found that Woolf’s work was made secondary to her life, which is perhaps as it should be. The books and essays and diaries speak for themselves, but their creator still remains enigmatic, no matter how long you stare into her huge eyes. Meanwhile, the difficult relationship which the young Virginia and Vanessa had with their ‘over-attentive’ Duckworth half-brothers was only briefly alluded to, as was Woolf’s relationship with Vita Sackville-West. While I have often felt strongly critical of some of the tenets of Bloomsbury life, I left feeling chastened by its vigorous, determined creativity, and with a reinvigorated desire to read or re-read more Virginia Woolf.